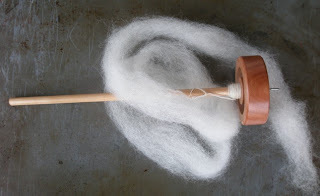 And within a week I found myself in a spindling class with Lorraine Smith, where I ruined roving for two hours before noticing much time had passed. Even when incompetent, spindling is an enthralling exercise, full of meaning and imagery perfect for busy stressed people and for writers. I of course fall into the latter category, being Not At All Stressed. Who could be stressed with so much gorgeous new yarn around from two weekends full of irresponsible yarn shopping? If nothing else, you can pile it up into a lovely tableau to stare at when feeling panicked about deadlines and other mess. But to return to spindling: there is one problem with learning to do it. You ruin such a lot of roving, in my case much of it just as strikingly lovely as pictured here. And that begs the question, which roving to ruin next? In a way you want to choose something nice, because you might be able to do a better job with it. But if chance and practice and stress are not balanced nicely, you will ruin something that could have been beautiful if only it had come to the spindle later in your life. But then there's the niggling notion that a really nice fiber might keep you spindling long enough out of sheer excitement that you make serious headway in your spindling finesse. Clearly I don't know the answer... but I will venture a guess that I don't want to be spindling anything precious and expensive from Fleece Artist on my first week out. Use up the *pretty* stuff- beautiful fiber is inspiring- it makes us better spinnersd and knitters. There is no such thing as unusable handspun yarn. If nothing else works, you can needlefelt it to a hat or bag.